Danny got a follow up blood flow study this morning. God is gracious and answers prayers. There are no more blood clots. They are all gone! Such fantastic news! We will also be heading home on Wednesday! We hope to be home in enough time to go pick up Ethan from school and surprise him. We are so excited to see everyone and to be home!! Blessings to all and pray for safe travels for us on Wednesday. Danny moved his toes on the right foot today! I posted video on Facebook. So exciting. God is good, all the time. We pray now that he progresses even more. He fatigues very easily. And it is so challenging for him to move muscles but eventually after thinking about the movements and trough repetitive repetitions his body will recognize those movements. Pray for endurance and more strength. We went back to Shepherd yesterday as got blood drawn to check Danny’s Coumadin level. He is finally therapeutic on his Coumadin. On Monday we go back to Shepherds again to have a blood flow study on his legs and left arm where he originally had the blood clots. Please pray for the blood clots to be gone so he can stop taking the blood thinner. It is really making his blood pressure really low a lot because his blood is too thin. Blessings to all and rejoicing in his goodness! Project Walk Atlanta has been AMAZING! Danny is pushing hard and doing so well. We are doing the family training program so that I can do his therapy when we get home the way Project Walk does it. The training is 25 hours. We are splitting it up in about two weeks. It’s a lot of work but fun. Danny continues to make improvements. There are a few items we need to work on getting for Danny to continue improvements. We are working on getting a used gliding standing frame. It will continue to help stabilize his blood pressure. It also helps him to be weight bearing which is suggested he do that for an hour everyday. It helps to keep his bones strong and good for his circulation. He will also need to be using The Total Gym with rope cables. Believe it or not he does a lot of important exercises on there. Yesterday ad today he stood at an incline on the bench and I unlocked his knees and he slowly and painfully started to press his knees back with some help. That does not mean he can move his legs but the weight bearing helps him to focus on the movement and he is able to help. Project Walk believes if you do a movement 1,000 times your body will recall it. So we have a lot of muscle groups to get moving. We will need to purchase foam wedges to prop Danny up to practice on core strengthening exercises. He then leans up against a wooden box. We have all the measurements and I have pictures to build them. They use those rubber exercise bands,Stepper platforms, yoga mats, and a padded table. We also have on our wish list an FES bike which stimulates Danny’s muscles. Danny will walk again it’s just a matter of when. Those who commit their lives to many hours of therapy a day are the ones who recover. It’s very hard work but we will figure it out and with the help of the wonderful experts at Project Walk to set us up with the proper exercises we will find the time in the days, months and years ahead. These are our greatest financial needs for medical equipment right now. Please pray for energy and strength for Danny. He really is a power house! Love to all an we are so blessed to be here and have all of you backing us up! Blessings to all!! Standing strong for our Lord! Okay. Way past due for an update. Danny was discharged from outpatient this past Wednesday and we moved in the apartments next to Shepherds to get ready for outpatient day program. So it was a lot of work for me to pack up his room and move over to the apartments and unpack everything. One of our techs helped me move things over. We have been enjoying some down time and in the process have even brought a wheelchair accessible van. We were able to pay cash for it with all the fundraisers that have been done. So thank you to everyone who has helped us. We owe it to you. It’s amazing that the van costs $38,000! But thanks to Scott Creel from Mobility works(HDS) for making it a smooth and easy process. Our first day of day program was just stating goals to the therapist and they told our case worker we needed to stay for 6 weeks. Then the caseworker broke the bad news to us We thought we were on scholarship for the day program. They would have used all our 35 visits of outpatient visits from our insurance. We planned on having those visits for rehab when we get home. The scholarship covered the copays only. They charged us 3 visits a day and would have utilized all our 35 visits in less than two weeks and would have to pay $450 a day to stay. After that news we had to regroup and decide what to do. Make no mistakes we love Shepherds! They have done so much to get Danny well again and to have gotten him this far! So we have moved into a hotel in Alpharetta to go to Project walk Atlanta( which is actually in Alpharetta.) If you get a chance look up Project Walk Atlanta. It’s very inspiring. It’s an aggressive and intense weight bearing exercise rehab. They will train me to rehab him on their techniques for two weeks. Then we come home! So that’s the plan for now. We meet with Paul Picard from Project Walk tomorrow afternoon. In the mean time we are excited that demolition is starting on the remodel of our home. Thank for your continued prayers and support. We love and miss you all! Blessings!! Danny shaved himself for the first time today. He only could do the left side but he didn’t miss a hair. That was the first time he got to use his new electric razor himself. He said” wow this thing is really nice!”. For the first time today he also used the hand bike. They strap his hands in because he cant hold on. He crushed it and in less than two minutes he was overpowering the bike and they had to make it harder for him. They use electrodes to stimulate muscle contraction and that did help on his weaker right arm. He was so nervous because of the subluxation on the right arm and intense hypersensitivity. He was scared it would hurt like crazy and make it worse. To tell you the truth I wasn’t sure he was going to be able to do it. But I would never let him know that. I encouraged him and was like a cheerleader as always. I sound so goofy on the sidelines, you should hear me and Danny laughs at me. LOL! But hey, the cheering pushes him to work harder. The peddling didn’t hurt his subluxation like we suspected and he did amazing. After that he even powered through with more upper body exercises with his OT. Yesterday was a really tough day for Danny. He was feeling really down in the dumps, home sick and bored of the same cafeteria, same old everything. Honestly I was too. He just wanted to do something fun and he can’t…here, and now. I made him watch a movie a fellow Keller Williams agent, Linda gave us. She teaches a class called BOLD. She showes this old movie from the 80’s called The Miracle Man. 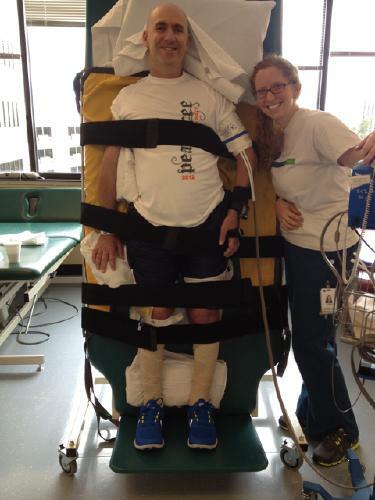 The way they showed the rehab of this mans spinal cord injury rehab was a little off and we laughed. But it was movie making in the 80’s at its finest. The bigger message wasn’t that he had a C-1,C-2 injury and that he walked again. The message was that he didn’t listen to what anyone told him. He willed himself better. The man in the movie listened to Zig Zigler tapes, who happened to be a motivational speaker that Danny used to listen to. I can remember Danny telling me about him. That positive message sparked a fire in Danny that shook him out of the funk he was in and he had a fire in his eyes that even Satan wouldn’t walk through. He is getting stronger and pushing through pain that is indescribable. I’m so proud of him and he is really working hard to get back his body again. We are both exhausted. It’s a lot of work. I stay right there with him while he’s in the gym trying to learn simple tasks like sleeping on his stomach. Because I also am learning a lot as well. Thank you everyone for your prayers and your efforts back home. We miss you all an incredible amount and can’t wait to get home but we know this rehab is so crucial to Danny’s recovery and we are learning so much! blessings to all. And never take for granted the life God gives you. He did it! 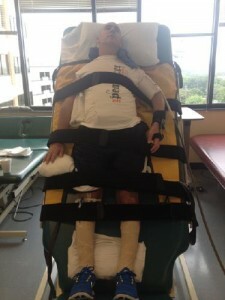 He beat his 60 degree angle record today with a wooping……80 degrees with blood pressure strong at 83/60!!! Woooohooo!! Throwing our hands up in the air saying ahhhooo!!celebrate! The picture is with his OT Shannon. She’s awesome!! This is how Danny works on his blood pressure. Tilt table. He is nauseous but is powering through. Danny got into day program on the 27th!!!! His inpatient will be extended till then. We are so happy to hear that news. We went down to day program today and they have treadmills that connect your upper body with support while one person sits at both side and position your feet to walk. They also have Loco-motor mat that is a robotic form that helps you walk. Thanks for your prayers. We are excited!! So many good things to continue to report. So Danny’s hole from te trach closed up in 4 quick hours. He can’t even blow air through it. He still has a raw area that needs to heal completely but it should be completely healed by next week. He is truly on healthy boy now!!! Because otherwise is no open airway now we were able to get rid of a lot of supplies that were junking up the room and his suction cart! He also has a better controlled heart rate now,it was too low, but controlled with medication. But he doesn’t need The medication anymore. So because of that he was able to loose the telemetry box that is attached always to him with electrodes. His chest was always raw, he’s been wearing them for 3 months! And he had to be shaved so they didn’t pull all that furry chest hair and he always looked like he had an extra belly in all his pics. Danny is now brushing his teeth on his own too!! Danny got his tracheotomy out this morning!!!! His doctor said that was his best X-ray yet!!!! Praise God for that answered prayers. He went over to Peidmont on his own to get his cervical X-ray this morning. He felt so bare not having to tote his suction cart with him and to actually have the freedom to be more independent. Huge for Danny. Tomorrow the electrodes come of. Which has been tearing his skin up on his chest. Our date last night was absolutely wonderful!!!! We had help from a crossing guard as to how to enter the restaurant where the ramp is. Once we got in every one was so accommodating and pleasant to us. It was kind of funny to catch some people staring or trying not to look. But when Danny scoots away from the table and lays his chair back and his feet up in the air to do a weight shift, it tends to draw some attention. LOL!! Every time we go out we feel even more confident. Tonight we go on an outing to the Chinese restaurant. Should be fun as its with a group. This afternoon we have a goal meeting with Danny’s medical team. Pray for positive outcomes. Danny’s next goal is to get that right arm stronger and moving….and of course to walk!!! Thank you all for celebrating this huge hurdle with us!! Making progress is fun!!! Many blessings! !